It’s always rad to see some well deserved riders who have been flying under the radar get some support. 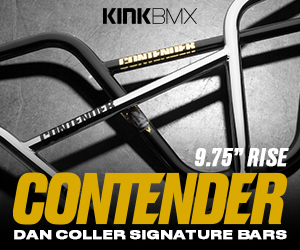 DK Bicycles have added Brad Moore to their line up, and it’s easy to see why! Hit play on this BMX video if you’re looking for grinds, nose balance and some big drops! “The DK DAMN KIDS program is designed to help out riders with a co-factory support level of sponsorship. DK has always been very selective in who they choose to represent the brand. Great riding style and skill is not the only requirement, positive roll model and good character are equally important. With this being said, we would like to welcome Brad Moore into the DK family! Brad rides a DK Team frame.